This is going to be the last outdoor meetup for a while, although I might go a few places by myself outdoors for a while yet. When it’s just me, it’s easier to take a/c breaks, or just decide “eff this, it’s too hot, I’m going home”. I got some mild heatstroke: a splitting headache and nausea–I had a cup of turtle soup with lunch that was very good, but it started repeating on me in the form of burps, and that wasn’t so good. About 40 oz. of ice cold Diet Coke (sweet nectar of the gods) and some prescription-strength Aleve fixed me up; plus some rain clouds started rolling in and it cooled just enough, but even in the car I couldn’t stop sweating until I got home and took a cool shower. I didn’t grow up here and I doubt I’ll ever acclimate to the summer weather (which generally starts in May). Still, March and April and even the beginning of May were unusually cool, so I’m not complaining. I think I’m going to have the next meetup at the WWII museum in NOLA, which I’ve never been to. Anyway, Donaldsonville is the seat of Ascension Parish and almost exactly midway between Baton Rouge and New Orleans. My GPS took me there via I-10 (which is how I drive to Baton Rouge) and home via LA-90 (which is how I get to NOLA), and both routes took just over 2 hours. It’s a small (about 7,500) town but a historic one. It was the state capital for a single year, 1831-1832. Apparently the politicians thought they’d get more work done without the cultural and social distractions of NOLA (Baton Rouge didn’t become the capital until 1849), but they must have gotten too bored, because they moved back after a single session! 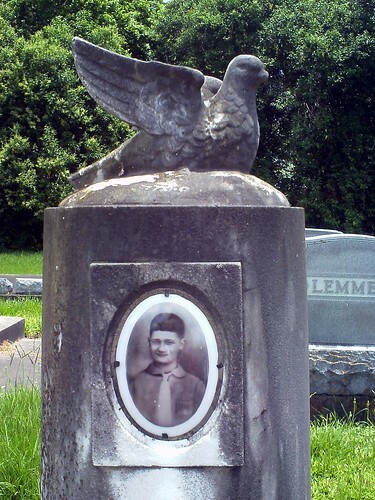 There’s a 19th century Jewish cemetery in the town, Jews from all over south Louisiana requested to be buried there. There used to be a synagogue, but it disbanded in the 1940s (the building is now an Ace Hardware) due to there not being enough members. I guess religion wasn’t as important to the younger generation as fitting in, and they all eventually converted. There are still some Jewish names in the town, but none of them practice anymore. The original Church of Ascension dates to 1772, although the present building was constructed about 100 years later. 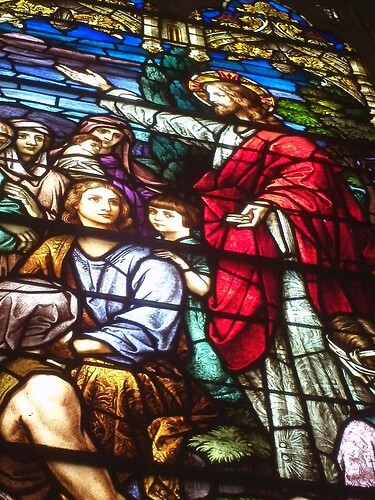 The stained glass is beautiful, but they keep plexiglass over the outside, which kind of dims it. But I guess you can’t pound boards into 150-year-old brick when there’s a hurricane coming (and some of the windows are really high up). There are some cool old buildings downtown, but a lot of them are closed and starting to fall apart. 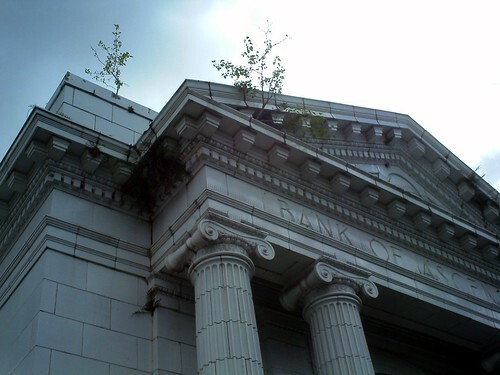 This is the old Bank of Ascension building. It’s for sale! 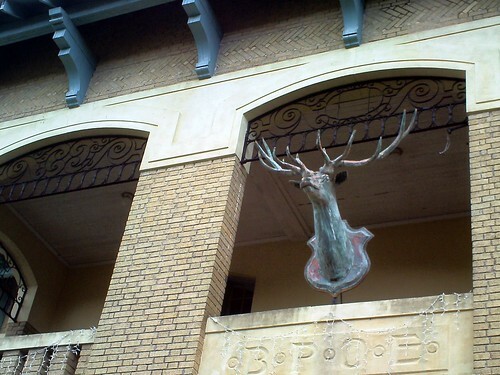 This was the local Elk’s Lodge. Of course, I couldn’t resist a giant stag head that seemed to be floating in space; I got a pretty good Silver Shade instant, too. The Masonic Lodge was directly across the street, do you think they rumble with each other? 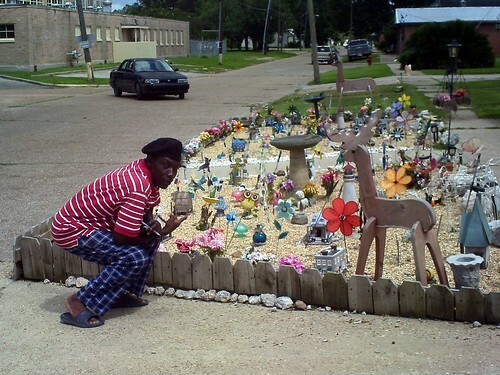 This guy was a trip, he saw Hope and I gawking at all the stuff in his yard and was like “Hey, take my picture!”. Then I printed out a copy for him from the Zink printer and you should have seen the amazement on his face. He kept trying to give me money for it, I was dude no, it only costs me like 50 cents. 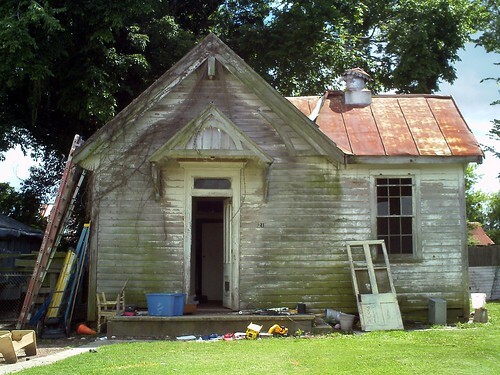 They had this old building in their backyard, his wife says it was originally the first Mormon church in Louisiana. It used to be right on the river, but when they built the levee it was moved and became part of the property.